Within this page, there are references made to the various Star Trek technical manuals. at this defintion of canon. speed of light (warp 9). The E-D is capable of sub-light speeds up to 0.92c (TNG:TM p 2). Starships at impulse speeds can target other ships at impulse speed. Starships at warp speed can target other ships at warp speed. the much older Enterprise NX-01) use phasers at warp speeds. Okay, so that what's agreed by all sides. or any of the movies, that says that ships cannot attack impulse targets from warp. The writers have never said that it is impossible. However, because it is potentially a powerful tactic, the debate has raged strongly. powerful the warp field, the more powerful the boost. (300,000km - 225,000km) in the direction of the ships flight. and would cover that distance in just 7.7 seconds. the speed of light. That means it would cover 4.05 million km in just 0.77 seconds. the target before it was armed. Luckily however, that isn't a major problem. may not be quite as powerful as a normal torpedo explosion, but it will happen. range than that stated in the technical manuals. away to be seen), to striking the ship in around 2 seconds. things simple and give us a very generous lower limit. I know what you're thinking. "Those were Klingon torpedoes, not Federation ones". must be effective range too! starship can fire from far enough away, to make the 1 second arming time a non issue. enough, even without the warhead explosion, to ruin your whole day! argument often used is that given the speeds involved, targeting would be impossible. impossible. Anyway, let's leave that aside and concentrate on the argument. have Faster than light (FTL) sensors and computers designed for combat at FTL speeds. "Each main computer core incorporates a series of miniature subspace field generators. processed at faster than light speeds in the main computers"
devices which permit information gathering at speeds greatly exceeding that of light"
to get a target lock if the target ship was already at impulse speeds. has better and faster computers and sensors than a lowly torpedo. from warp to impulse, it follows that so could a starship. warp ramming, the starship would be effectively performing the same job as a torpedo. power is just .300 milliseconds. That is very fast indeed! their course all the way in if necessary, until they impact. speck of dust could be dangerous. ship, pushing aside larger objects that present a collision hazard." directed at specific targets in the projected flight path." The proof seems clear that targeting is not only possible, but is done regularly. The "We haven't seen it done, therefore it can't be done." argument. just as it is impossible to explain every tactical decision in real military history. case ARE used as examples of warp strafing. it was clear that the enemy did not want to destroy the station, merely capture it. old DY-100 class ore freighter called SS Woden. 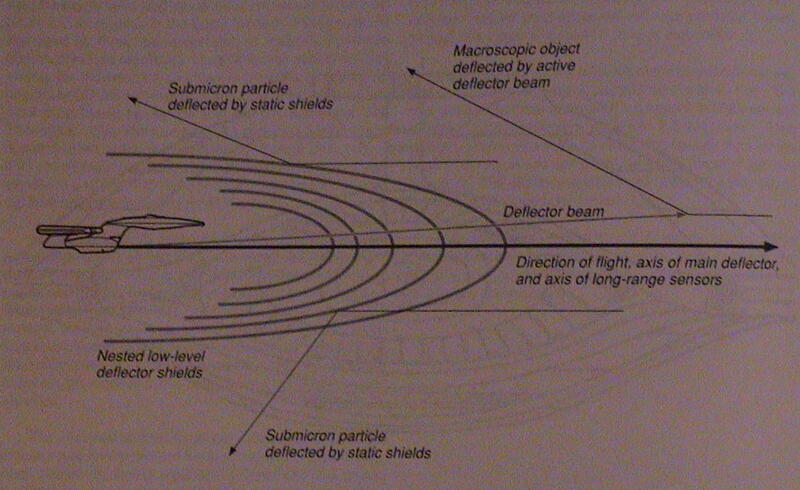 long sub-light travel between stars (ref ST:Encyclopedia). are fired and the Woden is destroyed. A clear case of a warp-impulse attack! of the ship is an asteroid that the ship will hit before helm control can be regained. slows to impulse, do the stars appear to be stationary. Asteroids are natural phenomena, and cannot travel at faster than light speeds. at slower than light speeds. stated in the episode and supporting official material. of warp this must be a warp to impulse attack. the war zone. Maybe there was a Romulan 'tug' waiting for it. We just don't know. A final example can be found in the oft quoted, "Elaan of Troyius" episode. "Mr Sulu, standby to make your maneuvers smartly, she'll be sluggish on response"
"Manoeuvre? Aye, we can wallow like a garbage scow against a warp driven starship." "She won't respond fast enough on impulse"
was in danger, and that is only possible if the Klingons could attack at warp. obviously feels that the Enterprise needs warp speed to adequately defend itself. for the ship to be at warp. necessarily even the range to the Klingon, or even the actual speed of the two ships. 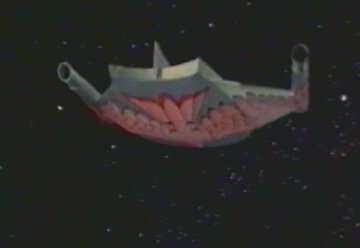 therefore be impossible for the Enterprise to avoid (as was shown in the episode). also talking in this scene, and he is clearly stating the speed of the Klingon ship. decide who you would trust. to state the Klingon speed, saying they are "..better than warp seven". shown FOUR examples of the tactic actually being used. Therefore, warp strafing MUST be possible.